Work to railbank the new 145-mile segment of the Rock Island Trail from Windsor to Beaufort is progressing. State Representative Tom Hurst hosted a meeting last week to inform local citizens about the trail. 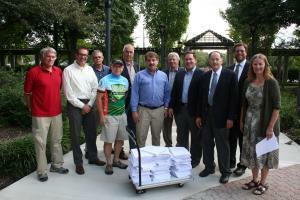 MoBikeFed has been working closely with the Rails-to-Trails Conservancy and the local trail supporters at Missouri Rock Island Trail, Inc, to build support for the trail, contact legislators, gather and present over 11,000 petition signatures in support of the trail to Ameren, and alert trail supporters who live near the trail about Thursday's meeting. At the meeting, trail opponents packed the house, but thanks to our coordinated efforts, trail supporters were very well represented, too. What happened at Thursday's meeting? Dozens of landowners packed a Thursday night town hall meeting to air their frustrations with a proposed bicycle trail. The Missouri Central Railroad Company, which is owned by Ameren Missouri, plans to convert the largely-abandoned Missouri Central Railroad into a trail running from Beaufort to Pleasant Hill. 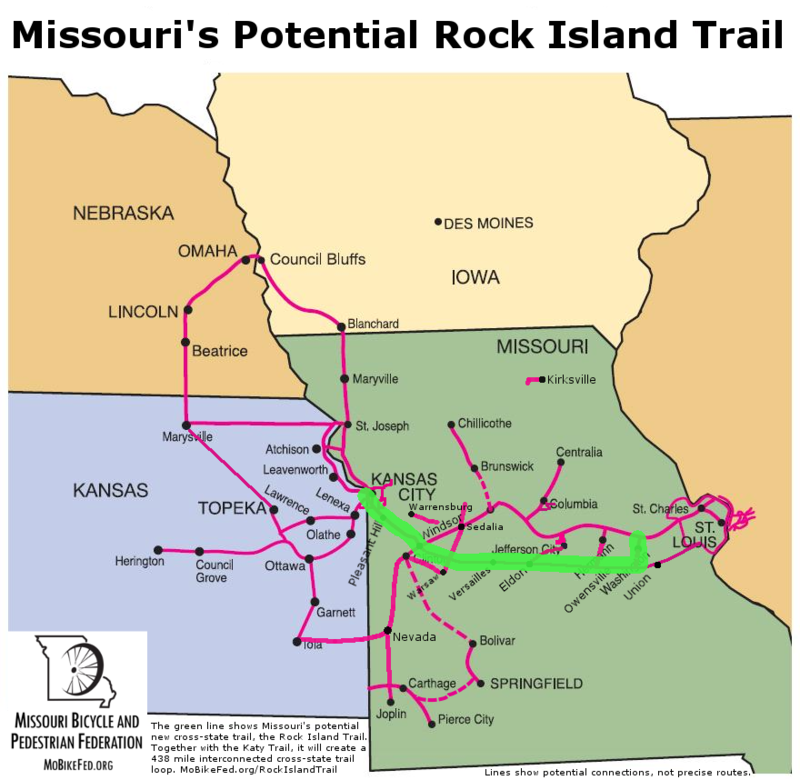 The Rock Island Trail would run through towns like Freeburg, Eldon and Versailles. Ameren owns the railroad's right of way but not the ground it sits on. Still, under the National Trails Act, Ameren doesn't need to consult or compensate landowners like Rodney Luebbering. . . . The project's supporters pointed repeatedly to the economic success of the Katy Trail, which was also converted from a rail line. Missouri State Parks Director Bill Bryan said towns like Rocheport and Hermann were able to open the wineries and cafes they are famous for because of that trail. Bryan acknowledged fewer people live along the Rock Island Trail's route but insisted the trail would still bring businesses that would improve local tax bases. Missouri Central Railroad President Robert Neff said he has biked the Katy Trail and felt a similar trail is the best use of the current land. "It would stir up economic development, provide a healthful lifestyle for the communities along the line, and be a tourist attraction for people from other parts of the country," he said. Supporters of the trail use the Katy Trail as an example of the potential economic boon the trail would have on communities directly in line with the project. Missouri Parks director Bill Bryan said towns like Rocheport enjoy greater tourism and tax revenue because of the Katy Trail's proximity. Some community members also felt a recreation trail may spur a more active lifestyle. Jody Miles, a member of the trail advocacy group MORIT (MIssouri Rock Island Trail), said her's and other's children currently can't walk to their school in Owensville due to the two-lane highway the school sits near. However, a new trail in place of the seemingly derelict railroad could change that. "The railroad goes underneath Highway 19 and runs the whole length of the school district," Miles said. "And thus, it would allow for students to actually be able to propel themselves to school. However, land owners and the Missouri Farm Bureau see the railroad's conversion to a trail as a circumvention of the rights of the people whose land the Ameren railroad sits upon. If a trail did go into place, the land owners would need to build a fence around their property not to interfere with the trail. Bryan said the state would pay for the materials to build to fences, but not the labor to build it. Bryan added land owners may not be happy with the work the state does, and leave the work instead to them. However, some at the meeting saw it as another burden the state placed upon potentially unwilling land owners. "They don't like the thought of tax dollars having to be used for something for that," one affected land owner from Argyle said. "I mean, a bicycle trail in Argyle? I don't see it paving the streets in Argyle, because we've got potholes, folks." . . .
State representative Tom Hurst, a Republican from Meta, hosted the meeting. He said he wanted all stakeholders to come to the table and dispel rumors around the project. He admitted the project, if approved, would not see any construction beginning for another five or six years. However, the meeting was intended the shape a conversation early as the process with the Surface Transportation Board continued. Trail opponents, led by the powerful Missouri Farm Bureau, are very organized--just as they were when the Katy Trail was created back in the 1990s. For that reason, trail supporters need to be just as well organized. We need to defend not only the trail itself, but the railbanking laws that make trails like this possible. 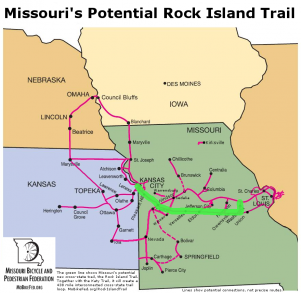 Find out more about the Rock Island Trail and how it will connect with the Katy Trail and other proposed and existing statewide trails here. 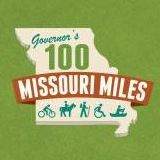 Supporting statewide trails like the Rock Island, and creating a statewide trail system, like the 457-mile Katy-Rock Island Trail system will be when complete, is one of the top goals of MoBikeFed's Vision for Bicycling and Walking in Missouri. Your membership and generous financial support helps make our Vision a reality!